Thiru Pavala Vannar temple is one of the 108 Divya Desams of Lord Vishnu located in Kachipuram and this temple is very close to Kanchi Kamakshi Amman Temple. 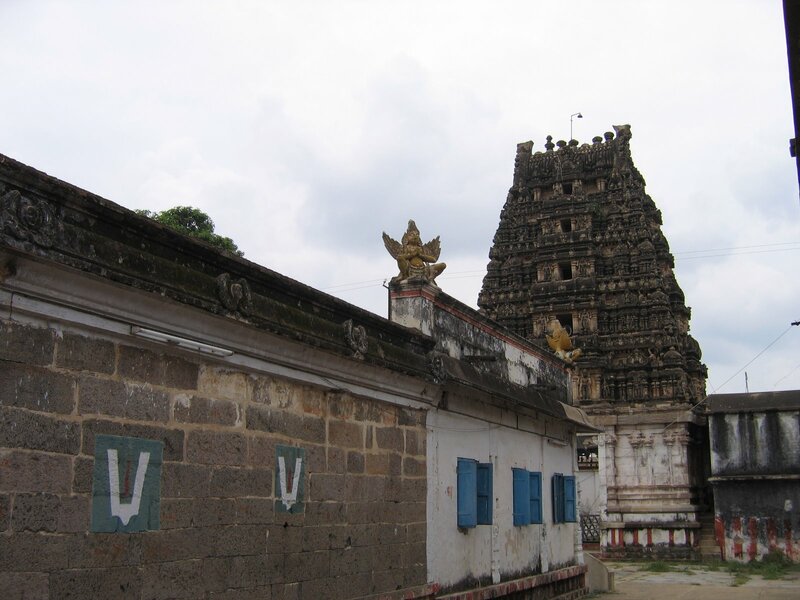 There are two temples Thiru Pavala Vannar Temple and Thiru Pacchai Vannar Temple are positioned opposite to one another and collectively known as Divya Desam temples. 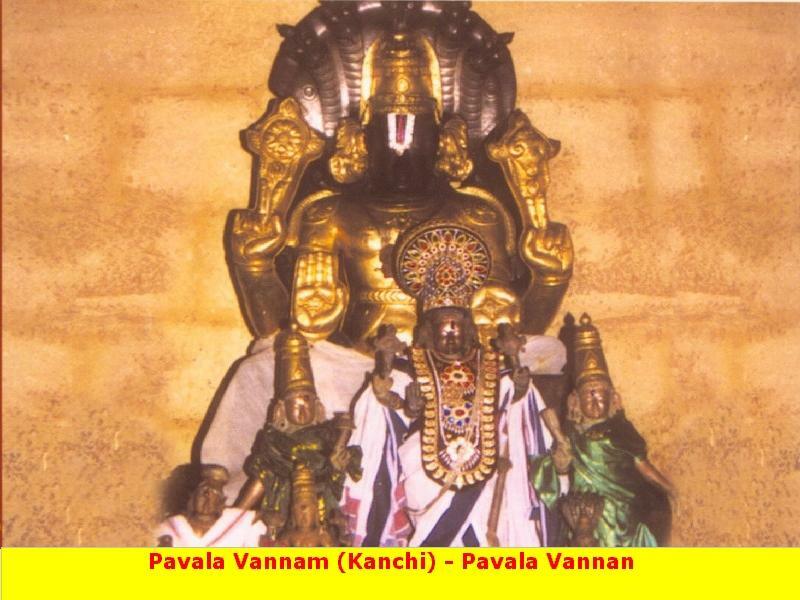 It is said that both the Pacchai and Pavala Vannan perumal has to be worshipped, without leaving any one of them. Opposite to Pavala Vannar Sannadhi, 02 kms away is the Pacchai Vannar Sannadhi is situated in west direction. Inspite of the Mangalasasanam not done in Pacchai Vannar sannadhi, both these two temples are considered to be the single and has to be worshipped as a single Divya desam. In this temple main deity Sri Pavala Vanna perumal can be seen coral red in color, Goddess Pavalavali Thayar has a separate shrine within the vicinity. The legend has that Lord Brahma conducted a Yagna. The most infuriated Goddess Saraswathy sent demons to create an obstruction. At this point of time, Lord Brahma prayed to Lord Vishnu to protect the Yagna from the atrocities of the demons. Lord Vishnu had fierce battle with the demons and beheaded all of them. Thus, the presiding deity of this temple is in coral red in color as a representation of aftermath of the war. In this temple Thiru Pacchai Vanna Perumal/Maragatha Vannar/Paramapadha Nathar is Emerald green in color. The legend has that Sage Brighu underwent severe austerities and performed Yagna praying to Lord Vishnu. Lord Vishnu pleased at the devotion of Sage Brighu and provided him a boon. Sage Brighu prayed to Lord Vishnu for a boon to have Goddess Sri Mahalakshmi as his daughter. The most compassionate Lord delighted and blessed Sage Brighu with a daughter Bhargavi. Subsequently Lord Vishnu married Bhargavi – Sri Mahalakshmi in this sacred place. Prathyaksham to – Sage Marichi. In this temple Lord Pacchai Vanna Perumal gave dharshan as Lord Rama with his consort Goddess Sita Devi to Sage Marichi. The legend has that Sage Marichi underwent severe austerities and pleased Lord Vishnu. Sage earnestly enquired Lord Vishnu about the purpose of his incarnation as Lord Rama in Thretha Yuga and subsequent outcome of Goddess Sita Devi’s abduction by the demon King Ravana, Lord Rama’s fierce battle with the demon King Ravana etc. The most compassionate Lord Vishnu gracefully revealed the purpose of his incarnation as most essentially for the restoration of righteousness in this land. Lord Vishnu’s incarnation as Lord Rama known as ‘Poorna Punya Avathar’, Lord Rama lived in this sacred land and set an example for the whole world with his Kindness (kindness to his devotees), Generosity (Generous towards the monkey King Sugriva and close companionship with Anjaneya and his army), Affection (affection towards his brothers Lakshman, Bharatha and Shatrugna) and last but not the least firm devotion and responsibility (to keep up promises and abide by their rules) towards his parents. Sage Marichi was deeply moved at the self-sacrifice of Lord after listening to him. Festivals – Vaikasi Visakam, Ani Thirumanjanam, Vaikundha Ekadashi. On the 5th day of Vaikasi, Kanchi Varadarajan comes here on a procession from Chinna Kanchipuram. The temple is open from 08:00 a.m. to 11:30 a.m. and from 04:00 p.m. to 07:30 p.m. The temple is at 3 kms from Bus Stand. East of Ekambareswarar Temple.